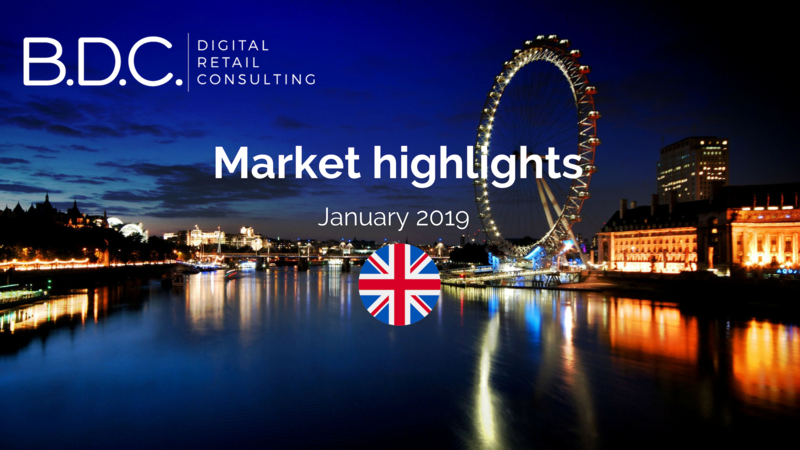 After a slight 1.2% increase in sales volume in November, due to Black Friday, British retailers suffered another decline of 0.9% for the month of December. In December though, online retail sales accounted for 20% of total retailing, a 13.9% growth compared to December 2017, according to the Office for National Statistics’ latest report. However, there was hardly any growth in clothing and footwear, while activity at department stores actually shrank. In 2019, British are planning to spend £25 billion in 2019 using their smartphones, a 66% increase compared to last year. There’s now more consumers buying online through their mobile (58%) than in shopping centers (56%), for more convenience and to save money, according to a study by Opinium. While 2018 saw about 20,000 stores close and 150,000 jobs lost, a research conducted by Altus Group predicts that a further 23,000 shops are about to shut down and 175,000 jobs will become redundant this year. Retailers have understood that as they focus on the opening of new immersive concept stores to attract customers. After a first successful one that opened in early 2018, Ikea will open its second Planning Studio in Bromley, south London next spring. Like the first one located in Tottenham Court Road, it will focus on kitchens and bedrooms planning to help customers from inner-cities imagine and design their ideal room. This forms part of Ikea’s strategy to bring its services and products to the heart of urban areas. Meanwhile, Ikea will open a new full-size, fully sustainable store in Greenwich at the beginning of the year. H&M continues to spread its Home concept across Europe, with a presence in five countries. Launched earlier in 2018, with a first store in Westfield London, H&M now plans to open next spring a Home concept store in Regent Street. The shop will feature H&M Home assortment of products and a curated selection of other brands’ products. The objective of H&M Home stores is to complement its digital offer by providing personal advice from the employees and by allowing shoppers to interact with the products and feel inspired. After Milan and Berlin, Lush opened last Friday its first “Naked” concept store in Manchester, with all products sold without any packaging. Users will be able to scan items using LushLabs app. Via product recognition, shoppers will get immediately get ingredient information, price and video demos on how to use it. Lush’s digital research and design team, named the “Tech Warriors”, will also release some ongoing experiments on the LushLabs app. Earlier this week, Marks & Spencer launched a photo search feature on its mobile website. Customers will be able to search for items by uploading a picture of a style they like. As the retailer aims to become a digital-first retailer, more than 75% of all its online traffic now comes from mobile. M&S plans to receive one third of its clothing revenue from online sales by 2022. This new feature offers a complete new enhanced shopping experience to customers that are now able to find a style they want in seconds.